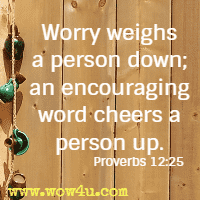 Let these encouraging bible verses give you encouragement, comfort and inspiration. There is no better encouragement than from the Word of God. These verses from Scripture are ones that are uplifting and offer hope. ". . . the best encouragement comes from the heart of God through the pages of His Word." "External evidence includes things like the number of copies of the Bible from around the time that it was written. That's what historians look for to see if a book is accurate and true to dismiss any possibility that a book was changed as it was passed down from generation to generation. There are 5,366 copies of the Bible from when it was written to just 70 years afterward." This is my command - be strong and courageous! Do not be afraid or discouraged. For the Lord your God is with you wherever you go. It is far too easy to assume that God is not near you or with you when there are times of anguish, problems or pain. The truth is, however, that no matter what we are experiencing, no matter what we are dealing with, God is with you. But, lean not on your own power to overcome or to work through issues that seem daunting. First, draw close to God in prayer and ask Him to walk with you, to counsel you, and to give you the strength that you need. Be strong and bold; have no fear or dread of them, because it is the Lord your God who goes with you; he will not fail you or forsake you." 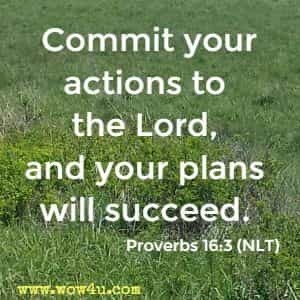 For I know the plans I have for you, says the Lord. 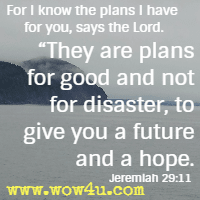 "They are plans for good and not for disaster, to give you a future and a hope." I look up to the mountains - does my help come from there? My help comes from the Lord, who made heaven and earth! 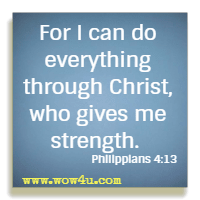 What help can a powerful person give you? Are you willing to put your confidence in a mere mortal? No person is any better than another; there are no favourites in the eyes of God. What may at times seem to be an earthly solution is never a solution that provides for eternal life. 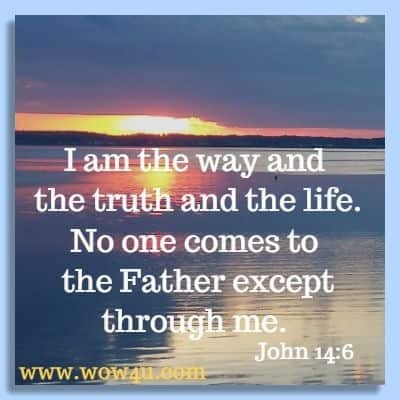 The only way, in fact the only assured way, is to put your confidence in the power of our Lord who died and was resurrected so that whoever believed in Him would be with Him throughout eternity. The humble will see their God at work and be glad. Let all who seek God's help be encouraged. "Be careful! When you do good things, don’t do them in front of people to be seen by them. 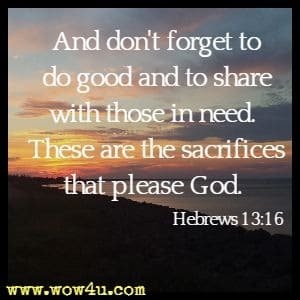 If you do that, you will have no reward from your Father in heaven." Therefore, angels are only servants - spirits sent to care for people who will inherit salvation. so that Christ may dwell in your hearts through faith. And I pray that you, being rooted and established in love, may have power, together with all the Lord’s holy people, to grasp how wide and long and high and deep is the love of Christ, and to know this love that surpasses knowledge -that you may be filled to the measure of all the fullness of God. "So let us not grow weary in doing what is right, for we will reap at harvest time, if we do not give up." "And He is before all things, and in Him all things consist." One of the most devastating human emotions is that of worrying. Worry has never accomplished anything positive nor has it extended your life by one minute or changed the course of events. When a situation or issue is beyond your control or influence, worry can't change or alter anything. The truth is that one can overcome any of life's issues through God's help. 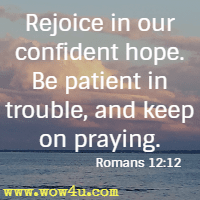 Through prayer give your worries to God for He loves you. Such things were written in the Scriptures long ago to teach us. And the Scriptures give us hope and encouragement as we wait patiently for God's promises to be fulfilled. That is why we never give up. Though our bodies are dying, our spirits are being renewed every day. 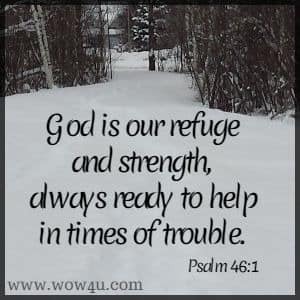 For our present troubles are small and won't last very long. Yet they produce for us a glory that vastly outweighs them and will last forever! 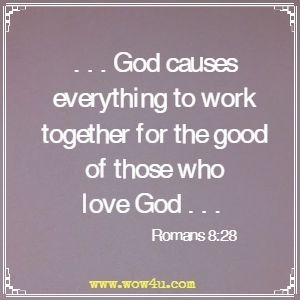 So we don't look at the troubles we can see now; rather, we fix our gaze on things that cannot be seen. For the things we see now will soon be gone, but the things we cannot see will last forever. "Blessed be the God and Father of our Lord Jesus Christ, who according to His abundant mercy has begotten us again to a living hope through the resurrection of Jesus Christ from the dead"
Have you ever received help, advice, counsel or friendship when you had to face difficulties? Whether we like to admit it or not, everyone of us has received some sort of help or aid somewhere or sometime in our life. Maybe it was the friend who stayed with us when we were unable to look after ourself; maybe it was the kindness of a person who loaned you a few dollars before pay day so you could buy food for your family; or, maybe it was a church member who stood by your side when disaster struck. In each case, God gave you the blessing of comfort, of friendship, of assistance. 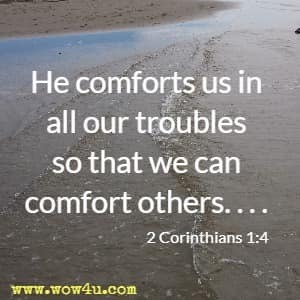 We are blessed with God's comfort through people who assist to the glory of God so that we can also bless and comfort people in need who are put in our path. For this is good and acceptable in the sight of God our Savior; who will have all men to be saved, and to come unto the knowledge of the truth." he will wipe every tear from their eyes. Death will be no more; mourning and crying and pain will be no more,for the first things have passed away." I have told you all this so that you may have peace in me. Here on earth you will have many trials and sorrows. But take heart, because I have overcome the world." To reflect on this passage is to understand that "peace" will not be the greatest part of our life here on earth without the inner peace that rests on our Lord. Even though we are in this world, we are not of this world. This means that we aren't at home; we only live on this earth but for a short time. Rejoice in the knowledge that our home is with Our Lord Jesus. Take solace and comfort in knowing that these trials and tribulations will be very short lived compared to eternity where there will be no more sorrow or tears. For it is by grace you have been saved, through faith-- and this not from yourselves, it is the gift of God-- not by works, so that no one can boast. 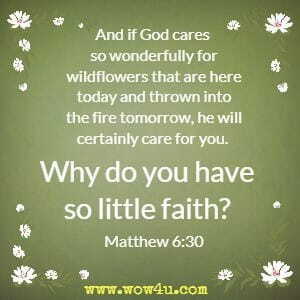 "So don't worry about these things, saying, "What will we eat? What will we drink? What will we wear?" These things dominate the thoughts of unbelievers, but your heavenly Father already knows all your needs. This passage can often be misunderstood to mean that we should be thankful "for" all circumstances. However, this would be in error. 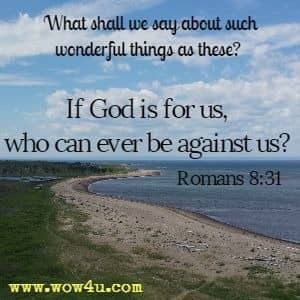 The passage clearly says that we should be thankful "in" all circumstances that we who believe have Christ walking with us no matter what happens. 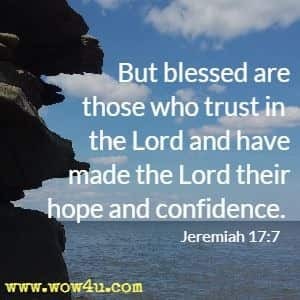 Our assurance is that even in circumstances that are difficult, we can affirm our belief and faith knowing that any testing is for our own character development. My dear, dear friends, if God loved us like this, we certainly ought to love each other. No one has seen God, ever. But if we love one another, God dwells deeply within us, and his love becomes complete in us - perfect love! What is the price of five sparrows - two copper coins? Yet God does not forget a single one of them. And the very hairs on your head are all numbered. So don't be afraid; you are more valuable to God than a whole flock of sparrows.